This is a stainless steel 2018 GL1800 Centramatic Wheel Balancer. This is available for bikes or trikes. The bike kit has 2 balancers designed to mount between the wheel and one rotor on the front wheel and between the wheel and the drive hub on the rear of your 2018 Goldwing. The trike kit has 1 balancer designed to mount between the wheel and one rotor on the front wheel only of your 2018 GL1800. Select the kit that you need from the drop down box when ordering. The price shown is for the trike kit. These balancers offer 35% to 50% longer tire life, lower tire operating temperatures, improved braking, increased stability, reduced vibration, reduced fatigue and increased tire footprint and grip in turns. These will fit all 2018 Goldwing and Goldwing Tour models. ABOUT CENTRAMATIC: Established in 1985, began by supplying the heavy-duty trucking industry in the United States and Canada with a unique "On-Board" balancing system for steer, drive and trailer axles. In the late 1980's, CENTRAMATIC acquired Perma-Balance, a company that manufactured balancers for light-duty vehicles and automobiles. This acquisition gave CENTRAMATIC a complete line of products from cars to pick-ups and as large as 18 wheelers. Over the years, business has grown to over 2500 dealers nationwide and some very prominent distributors as well. Paccar Parts (Kenworth and Peterbilt), Freightliner, Sterling, Petro's Travel Centers of America, Goodyear Wingfoot, TDS, GCR Tire Centers and Camping World are just some of the names you know and trust. With this growth and many years of experience, quality and reliability are of utmost importance, which is why we back our balancers with a Five-Year Unlimited Mile Warranty. Over 1,000,000 balancers have been produced and many are still in service with over one million miles of operation. On display at Corporate Headquarters is a balancer with 1,439,716 confirmed miles and there have been reports of balancers with even more miles on them that are still in working condition. Maximizing tire life is a primary goal for CENTRAMATIC, which is why we proudly display a 24.5" steer tire with 221,325 miles and 4 drive tires with 436,235 miles on the original tread. We have testimonials abound! CENTRAMATIC holds over 10 design and utility patents on this unique balancing concept and has other worldwide patents pending. Most heavy application balancers are made of 20 gauge galvanized steel with an aluminum balancing tube. One of our new processes actually forms a balancer from a single piece of aluminum. Anti-magnetic weights are suspended in synthetic oil and are automatically redistributed as the wheel rotates. Centrifugal force places the weights in exactly the correct position, down to 1/10th of an ounce. This produces a continual dynamic balance. It also compensates for out of balance conditions created by tire distortion, forced radial variation and other factors that greatly increase with 70-75 mph speed limits. Centramatic balancers have proven to increase tread life up to 50%, reduce tire cupping, minimize damaging vibration and improve tire tracking. 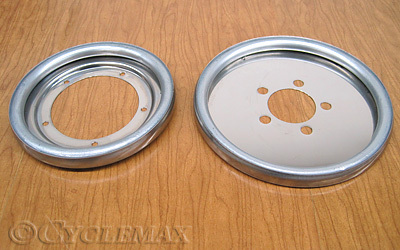 It is not necessary to pre-balance wheels before installing a Goldwing Centramatic Wheel Balancer.